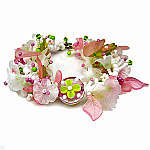 The Lucies' Garden Bracelet was our very first design published in Bead Unique magazine Spring 2007. Each kit is built around a theme and contains: Lucite, seedbeads, beading wire, crimp beads, thread, needle and instructions. The bracelets that show a focal lampwork bead are hand made and will vary from bead to bead but will be in the same general color theme to match the Lucite. The Leaves kits will not have a Lampwork bead.